Q: what types of cover are been used on the game? 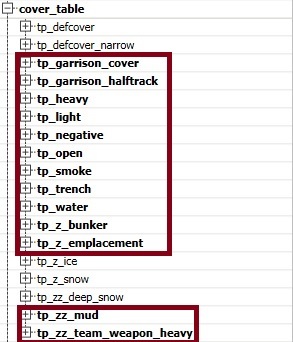 Water, halftrack, snow, trenches, bunker? I don't think open, smoke, trench, bunker, emplacement or defcover_narrow are used anywhere. "I don't think open, smoke, trench, bunker, emplacement or defcover_narrow are used anywhere." Thought there was a bug recently, or a nerf at least, where one of the Axis rocket arties was doing too much damage to troops inside trenches? From what i've heard, it had to do with the panzerwerfer ignoring all cover, and therefore wiping units in buildings almost instantly. Not sure if it's still around though. There is war spoils alpha ongoing and there is balance patch on the way.... we're having ESL and 10k active players daily with 5k peak time. That is couple of times MORE then some MMOs. CoH2 playerbase is BIGGER then Planetside 2 playerbase on PC. There is not a single thing indicating any logical reason to stop or even slow the support for CoH. We might not see another faction or big expansion, but that isn't exactly a bad thing. HELL, friggin DoW2 just got 2 DLCs recently, one cosmetic and one playable and how old that game is? Stop being naive and succumbing to rumors. - Is there a default door from which these units spawn out from? (I've tried using exit building, and it seems that for certain buildings the default exit does not always correspond to where Partisans will spawn out from). I'm certain units will exit out of doors at random if they are simply told to exit - such as in the case if you selected the building and told everyone to leave, or when an infiltration unit spawns and automatically exits. If you put a USF officer in a vehicle and use it around Riflemen in combat, does it attain veterancy faster? I can see creative usage of LT in M20 with a double zook M20 Crew if this is true. Put any usa infantry in jacson , shot several times some big tank , survive , hop out , profit. In "Micro Tips and Tricks - Episode III" from tightrobe he demonstrates that there is always a default exit. If you want to mine a building versus infiltration troops you just have to mine the default entrance. If you are curious which door is the default exit point just hit "Q" (when using grid hotkeys) when having a unit in a building. You can watch the Video at the Trending section. His videos are great and always worth a look. "After doing some testing using the t-34, is-2, isu-152, and panther I can confirm that the panther has a 75% front and 25% rear armor profile for most at weapons. Larger shells seem to hit rear armor even when aimed at the 50% area. These weapons are found on the is-2 and isu-152. Smaller weapons like t-34, panther, at guns have to hit behind the S in this picture for rear armor"
Earlier you said that its a 50:50 split like every other vehicle. Cruzz can you look into the Panthers hitbox model. I'm trying to implement my own homebrewn dps calculator for squads. Total time to shoot including reload = ((Shoot burst duration + Fire aim time + Wind up + Wind down)*Shots fire before reload) + (Cooldown duration * Reload frequency) + (Reload duration)"
Accuracy, penetration chance are capped at 1. Burst duration for non burst weapons is 0.125 (this game generally operates on 8 ticks a second, any amount of time is rounded to the closest 0.125). You will have to adjust rate of fire, burst duration, accuracy, cooldown and reload duration all with range. The one -cooldown is because there won't be a cooldown after the last burst before a reload. Both formulas basically, say the same thing (Cruzz's formula is a spiffy spinoff that allows us to factor ready_aim_time into DPS). Let' refer to Cruzz formula terminology for now. 1. If we look at Cruzz's formula, shouldn't "burst bullets" be equal to "1 + rof * burst"? The idea is that the 1st bullet always fires immediately, whereas the rest of the bullets have a delay of 1/rof between them. 2. Does the duration of "burst duration" change depending on the actual number of bullets fired? - Does the burst stop when the last bullet is fired (after 4.5 secs) -- so the wind-down starts earlier? I know that my question seems like nitpicking; however I think I have discovered certain weapons that are very sensitive to this discretization effect (e.g., Vickers_k when the UC is moving). 3. I have absolutely no idea how incremental accuracy works at all. 4. When I have both "multiplication" and "addition" veterancy modifiers that apply to the same stat. Am I right to assume that I should first apply the multiplication modifiers, and then the addition modifiers? Pretty sure it's a multiplier that is multiplied again for each model in the firing arc. Also, with respect to the same modifier, what do the search radius for "near/mid/far" stand for? Should be, yes. HMGs use incremental suppression similarly as well and is based on models instead of squads too. Not sure. It would sound like to me that it would matter if incremental accuracy gains more while more enemies are closer inside its firing arc instead of farther, but I'm pretty sure that doesn't exist. Might be vestigial. USF 81mm mortar (also affects mortar HT) has 106 range (same as 120mm), fastest firing mortar in the game with a 1.6 sec advantage over ostheer one, and about half the scatter of any other mortar in the game plus scatter reduction veterancy at vet1 and vet2. Schumines still have an engine destroy chance of 33%. .50 cal will lose its new penetration bonuses upon reaching vet2. EDIT: Or would, but the vet2 weapon change that used to give it faster redeploy has been broken by one of the recent patches, so in the end it does keep its penetration through all vet levels. B4 now costs 15 popcap for the gun. This is in addition to 15 popcap from the default crew. So it will cost 30 popcap until you wipe the default crew, and then 15+5 (with 5 man conscript crew) afterwards. JagdTiger will no longer get stunned by IS2, Relic accidentally deleted that part of the deflection as well. For that matter Brummbär and ISU152 were not changed in terms of deflection stuns, so it only affected IS2, Tiger I(+Ace) and King Tiger. LEFH & ML-20 vet2 scatter bonus works again. SturmTiger can't get abandoned while reloading if its between 75% and 50% health because Relic removed one of the abandon checks.